Dave Archambeau/Daily Mining Gazette Michigan Tech’s Jordan Ludescher drives to the basket during a game against Minnesota State Sunday at the Wood Gym. 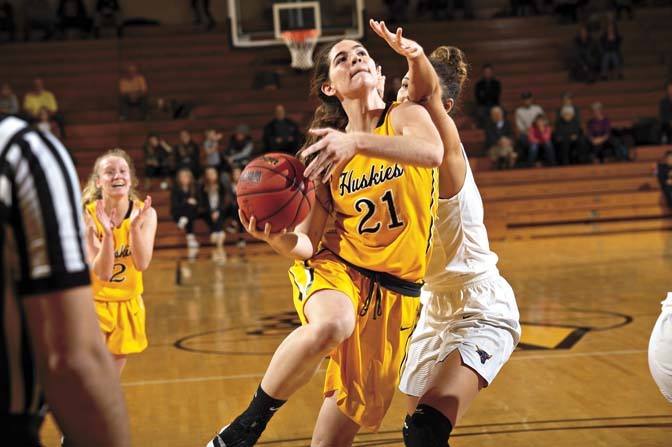 HOUGHTON — The Michigan Tech women’s basketball team suffered their first defeat of the season on Sunday as they fell to the Minnesota State (MSU) Mavericks in overtime, 71-68, at the Wood Gym. The loss put the Huskies at 3-1. In overtime, with the game tied 64-64, MSU’s Taylor Drost sunk the first shot and the Mavericks never looked back. They would go on to score at total of eight points in the extra session while the Huskies scored only four. Abbie Botz led the Huskies with 16 points and 17 rebounds. She was followed by Elizabeth Kelliher who notched 15 points and nine rebounds. Hoyt felt that her girls started slowly and that cost them in the end. “We started out slow and just did not have the energy and effort to execute in that first period,” she said. The Huskies Ellie Welsch dropped a short jumper to start the game, but those were the team’s only points for the first 4:30. At one point, the Mavericks led by seven points in the opening quarter. “Once you get down, it is hard to get the momentum to get back up,” said Hoyt. Hoyt added that it was the defense, or rather the lack of it, that contributed to her first defeat as a head coach at MTU. “Defense is what we hang our hat on, and it just wasn’t there today,” she said. The Mavericks shot 37.9 percent while the Huskies shot 40 percent. However MSU was 9-for-22 in three-point range (40.9 percent) while the MTU was 4-for-15 (26.7 percent). The Huskies shaved down the Mavericks’ lead to to four, 22-18, by the end of the first. In an effort to make up some ground in the second quarter, the Huskies picked up the pace a little and scored four points off some fast-break runs. By halftime, MSU’s lead was down to two, 36-34. 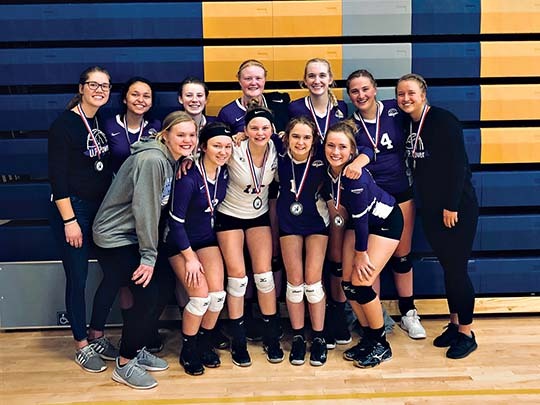 The Huskies were without one of their leaders, junior Baillie McGirk. She sat out on the bench in an arm cast after taking a hard fall in Friday night’s win against Minnesota State-Moorehead. “I told the team at half I didn’t think they were focused and I know (not) having Baillie out made somewhat of a difference and it shouldn’t,” said Hoyt. In the third, the momentum changed three minutes in. Hannah Hobson put the Huskies within one with a layup. It was followed 20 seconds later by a three-pointer at the top of the key by Cassidy Trotter. Trotter’s second three of the day put the Huskies ahead again, 43-41. However, the lead was short-lived as MSU’s leading scorer, Drost, dropped her own three-pointer from the left side of the court 45 seconds later. MSU held on to a slight lead, 49-48, heading into the fourth. Within the first two minutes of the fourth quarter, Hobson, Botz and Welsh would combine for seven points and the Huskies regained the lead again, 55-51. The Huskies would keep the lead until 5:40 remaining in regulation. MSU’s Maddy Olson was fouled by Hobson on the ground. She made both of her free throws to tie the game at 57. The game was tied again at 62 with 2:35 left in the game. Kelliher put the Huskies ahead with less than two minutes remaining with a short shot off the glass. Seconds later, Maddy Olson hit a jumper for MSU and tied the score at 64. The Huskies had plenty of opportunities to win the game in regulation. Kelliher missed two shots inside the key and Botz missed a layup.